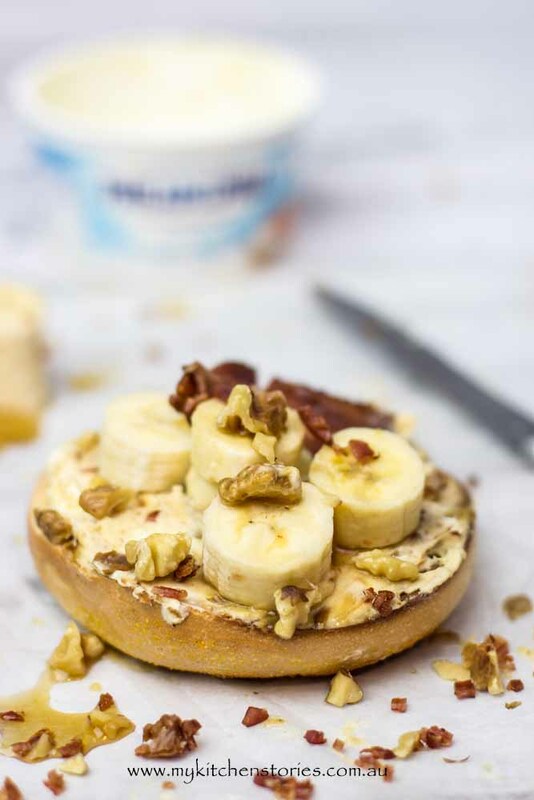 Creamy Banana Date Bagel with Bacon and Walnut Crumble make the best Brunch or Breakfast with lashings of maple syrup. This is such a good idea I am not sure how I didn’t think of it before. Crunchy, sweet salty and good for you….should they all be in the same sentence? On this occasion yes. It’s perfectly heavenly breakfast food. In fact when I was asked to make a series of recipes for PHILADELPHIA Australia, I thought it was a great opportunity to see what kind of new products they make. I am very guilty of using lots of PHILADELPHIA cream cheese to make cheese cakes. I love cheesecakes, don’t you? I go for the full cream blocks that I have always used, and they are always perfect. Cheesecake is my go to dessert because they use what ever ingredients are in season or in the fridge and also make a great gluten free dessert. I kind of fall back on that one. I haven’t tried any of the other products PHILLY make and discovered when making this recipe they have a few lower fat options. The idea that you can just spread a bit of delicious creamy low fat spread onto your bagel on the go is new to me. That’s why I have had this a few times for breakfast lately. I can eat lots of this creamy spreadable cheese, it’s delicious and it isn’t sweet. I really like that, I don’t like really sweet things despite my love of cake. Maple syrup is the perfect compliment to this PHILLY enriched bagel just because it too isn’t overly sweet, it just adds that balance. Bagels are really getting exciting around this city, with artisan bagel makers springing up around town so pairing PHILLY with them, just makes sense. They go together hand in glove. 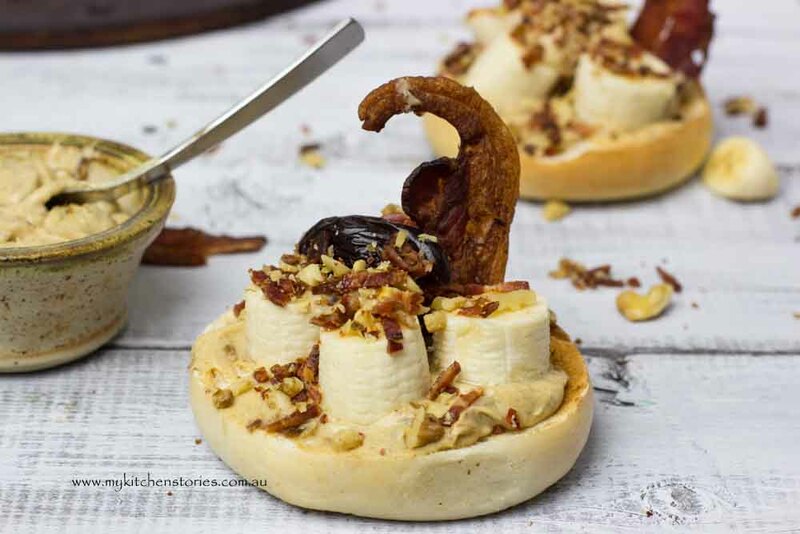 The dates in this Banana Date Bagel give the cream cheese texture and caramel notes but no real sweetness. 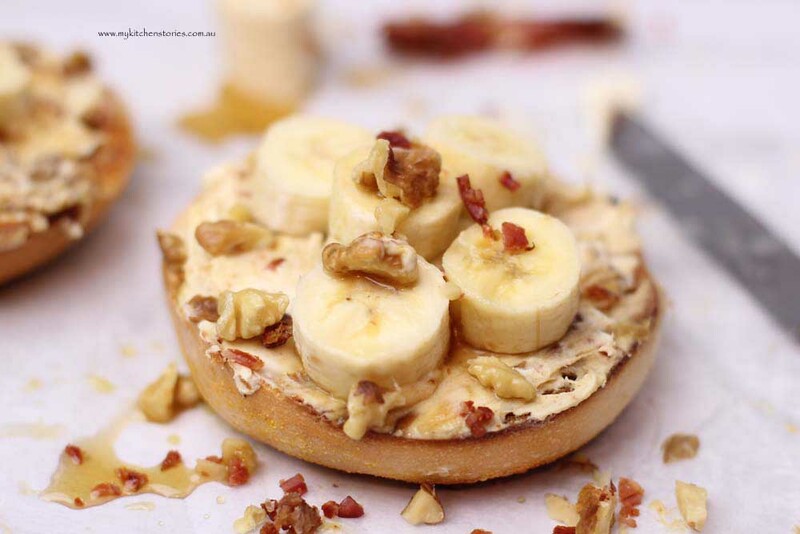 I added bananas because they are just delightful on crunchy bagels, but it needed salt and bacon in tiny crumbled pieces mixed with toasted walnuts make this completely irresistible. I wasn’t able to eat all of it at once so I put the left over date PHILLY back into the container stored away the left over bacon and walnut crumble and extra bagels and I repeated for breakfast for the next two days. I have more interesting recipes in this series coming up. Put the bacon on a tray laying flat side by side and put into the oven. It should take 10-15 minutes to bake. It must look a lovely burnished shade of brown and be easily crumbled. Once done sit on draining paper to cool down. Next toast the walnuts on a the tray for 5-8 minutes till lightly browned and crisp. Cool. While the bacon is cooking, put the dates into a bowl or jug with the water and microwave for 1 minute. ( you can also do this on the stove top). Take them out when they are hot and the water is boiling ( approx 1 minute) then stir them well and they will break down into a nice textured paste. Cool down for a couple of minutes and then mix together with the low fat cream cheese. When the bacon is cool crumble it nto pieces by hand or by chopping with a knife. Do the same with the walnuts and mix the two together ( these steps can be done ahead). Now all that is left to do is cut the bagels in half and toast. Spread with the dates PHILLY and top with sliced bananas. Sprinkle with bacon crumble and serve with generous amounts of maple syrup. 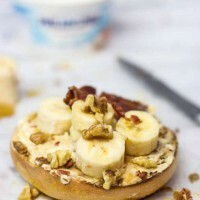 Now you’ve seen this one, if you want more PHILLY bagel recipes look here or if you are interested in the spreadable range check it out here. I WANT this breakfast! 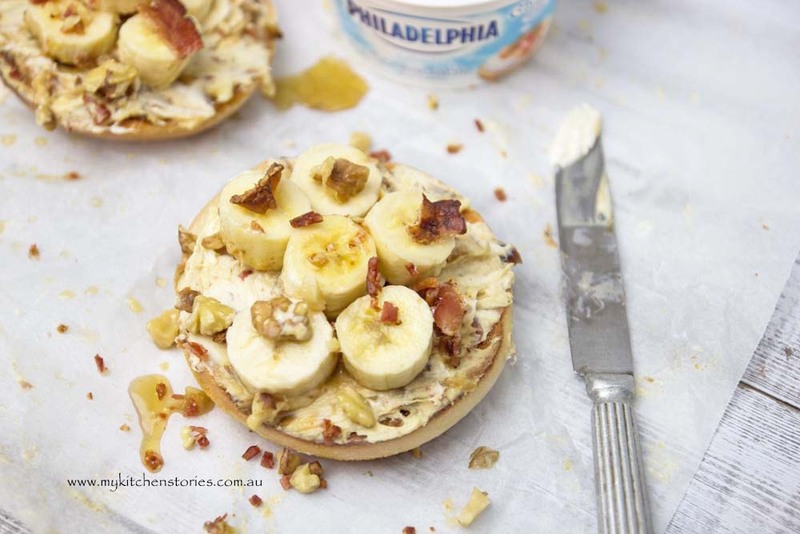 Love that you have sweetened the cream cheese with dates, crispy bacon and walnuts..EVERYTHING! An amazing breakfast, Tania. Bacon and cream cheese? Yes please! My, my…that just looks like a little bite of Breakfast Heaven! And simple to prepare as well. What an amazing mix of flavours. I’d love this with salty tofu in place of the bacon, or just without the bacon (I clearly have a sweet tooth 😉 ). and some great ideas Kari! The bacon and walnut crumble is such a tasty addition to this! I can’t get over how amazing this sounds – crunchy, salty, sweet – I NEED it!